FC Monmouth gave Monmouth County, New Jersey its own semi-professional soccer team to be proud of when they launched in December of last year and then kicked off their inaugural season in the National Premier Soccer League in May, but no one could have predicted the heights that they would hit in mid-July. The club’s efforts over the two-and-a-half-month season culminated in an appearance in the Keystone Conference Semi-Final last Wednesday where they were defeated by the eventual conference winners, FC Motown. Granting FC Monmouth that appearance was a 6-3-1 regular season record and a fourth-place finish in the conference table. After naming its coaching staff, FC Monmouth began its recruitment of players with two open tryout sessions on February 25th and March 4th, with the aim of building a squad of local talent to represent Monmouth County in mind. Two months later, the season approached. Head Coach Brian Woods and multiple members of the squad said that the players only trained together a couple of times before the first game and “didn’t even know each other’s names” ahead of kickoff. This continued to be a theme to look back on throughout the season as both the squad’s chemistry and performances improved match after match. FC Monmouth’s maiden campaign began with a 2-0 loss on the road to fellow NPSL newcomers Atlantic City FC. “I like the way we played, in the first half I thought we did a good job,” Woods said afterwards. While there were positives to take, FC Monmouth played like a bunch of guys who did not know each other’s names – which they were. FC Monmouth brought the two losses into their home opener at Count Basie Park in Red Bank on May 26th. They were set to rematch Atlantic City FC in what would become a major turning point for the team in the early stages of the season. FC Monmouth welcomed their first Pennsylvanian opponents, Hershey FC, to Count Basie Park next. After the visitors equalized two minutes into the second half, it looked as though both sides would be sharing the points. In the 77th minute, defender Thomas Judge scored the game-winner with a dazzling effort that sent the home crowd into a frenzy. “I think that every game we play we’re getting better,” he said. “At this point we still haven’t played that much together. Our chemistry is just getting better and better as we play, so I’m really excited for it.” After two losses to start the season, FC Monmouth had won their first two games at home – something special was happening. After an unbeaten run of three games at home, FC Monmouth was given a reality check in the form of a tough 3-1 loss on Junior Lone Star FC’s home turf in South Philadelphia. Woods and his squad remained positive after the defeat. He said, “The guys didn’t seem down about it. They’re excited about playing at home on Wednesday night.” The support that was shown for the squad at home games by match-going fans grew to become a key motivator for the players. “This is a young group, they’ll bounce back, and they love it. They love playing for the club, they love putting on the uniform, and nobody was really hanging their heads,” Woods said. FC Monmouth returned home to get all three points against the Electric City Shock in a match highlighted by forward Daniel Vicente’s outstanding solo goal. After that, they travelled to Lansdale, PA, where they comfortably beat BuxMont Torch FC by four goals. At that point, it was nearing both the end of June and the end of the regular season. FC Monmouth’s positive turn of results since their 0-2-0 start to the season gave them an outside chance at sneaking into the playoffs as match nine approached. 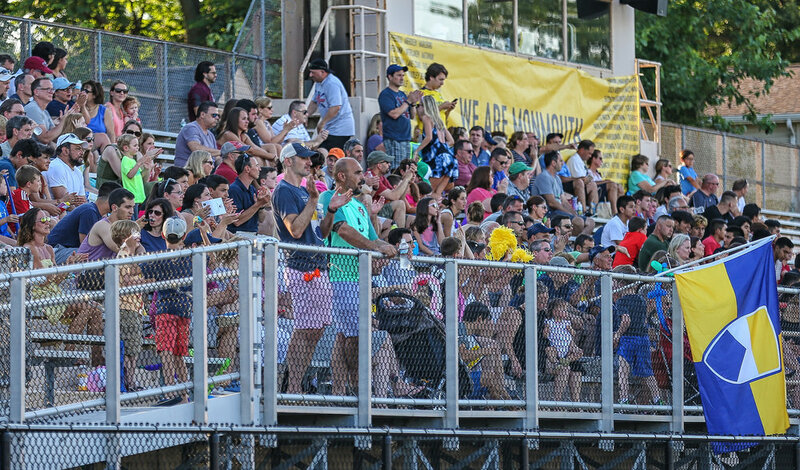 On June 30th, FC Monmouth battled second-placed West Chester United SC at Count Basie Park in a match where anything less than a win would effectively disqualify them from a chance at a playoff spot. 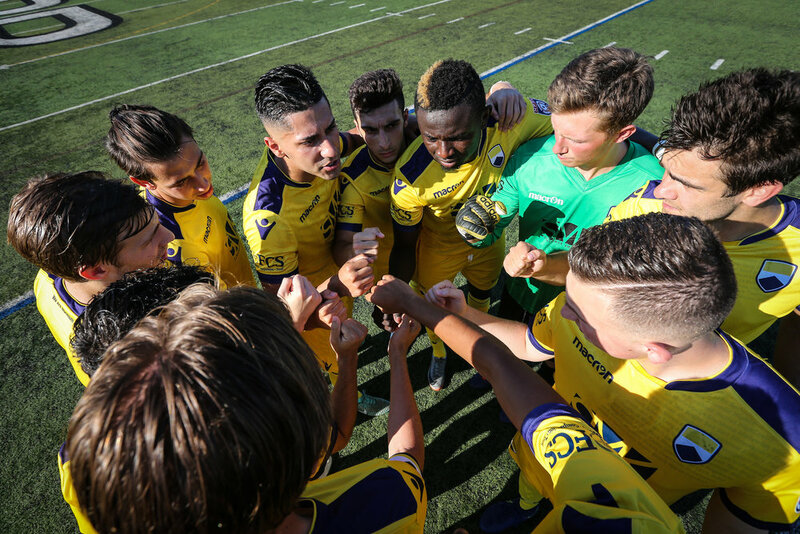 Earlier that day, Junior Lone Star FC defeated New Jersey Copa FC, meaning that a win for FC Monmouth would tie Copa on points with a meeting against them the next weekend looming. Finding a way to withstand attack after attack from a dominant West Chester United side, FC Monmouth scored in stoppage time at the end of the first half to take a 1-0 lead. An interception in midfield and a long ball sent forward Jordan Saling through on the counterattack, and he slotted his shot past the onrushing keeper. The win over West Chester set FC Monmouth up for a “win and you’re in” match against New Jersey Copa FC in the final game of the season. While level on points, a draw would not be good enough to earn Monmouth the fourth spot in the Keystone Conference table as Copa possessed a greater goal differential. Only a win would do – could you have written a better script? Forward Matt Thorsheim’s stunning volley gave FC Monmouth the lead in the first half at Mercer County Community College. Defender Matt Fryc’s tap-in on the end of a perfectly executed set-piece routine made it two just past the half-hour mark. After Copa quickly drew a goal back, midfielder Chase Covello’s deflected strike from long distance flew into the back of the hosts’ net to restore Monmouth’s two-goal lead before halftime. Finishing in the fourth spot of the table meant that FC Monmouth would be taking on the first-place team in the conference semi-final, which was FC Motown. A dismal 4-1 loss to the NPSL’s third-best team ended FC Monmouth’s historic opening season, but the team’s hard-fought journey to get to that point is what made it so memorable.